Cyclops | Learn about Greek Mythology,Greek gods,Greek mythology stories! The Cyclopes were mythical creatures of Greek mythology and Roman mythology with an eye in the middle of the forehead. Moreover the word cyclops comes from the composition of two words, bud and cycle and identifies a creature with a single eye in the forehead. The first category refers to a people of monstrous men, sons of Neptune, they had a single eye in the middle of their forehead. Mentioned in the Odyssey as residents, probably on the island of Sicily, in the Western Mediterranean. Savages, without any evidence of culture and social organization,they killed (and ate) those approaching their territory. 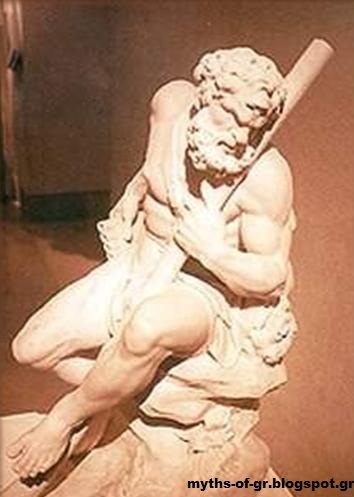 Odysseus and his sailors got to the coast and were trapped in the cave of the strongest of them, of Polyphemus. 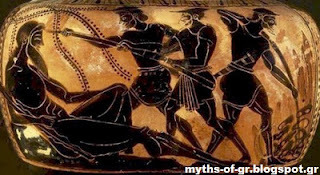 Finally after a notorious trick of Odysseus they blinded the Cyclop and managed to escape, but not without casualties. The second category concerns a triad of monstrous deities which appear in Hesiod and are children of Uranus and Gaea. These are three:Vrontis(thunder),Argis(slow) and Asteropis(star). They have tremendous power and therefore imprisoned in Tartarus by Uranus, being regarded as threatening his power. Subsequently, Saturn and the Titans released them, to help in the fall of Uranus but when they come to power,were again imprisoned in Tartarus. Finally, Zeus and the Olympians released them again and with their help bowl over the Titans at Titanomachy, thanks to the weapons (the lightning, the thunder, and others) thatconstructed under the supervision of Hephaestus in the Etna. When Zeus comes to power he entrust them the custody of the Titans inTartarus and they, in return gifted him,the lightning and thunder, thereafter were the trademarks of Zeus. To Artemis they gifted the hunting bow. The Cyclops were killed by Apollo in order to avenge Zeus, for the death of Asclepius. Thanks to medical healing abilities Asclepius, son of Apollo, brought back to life many dead and therefore for punishment Zeus killed him with thunder. The third category refers to a people of gigantic people to whom the Greeks of the classical era attributing the creation of giant walls that their remnants preserved in many parts of the country. Obviously, these walls were built in the heyday of the societies of the Mycenaean period. Strabo mentions that the Cyclopes came from Lycia and build walls and other structures at Tiryns and Mycenae, known as the Cyclopean Walls.